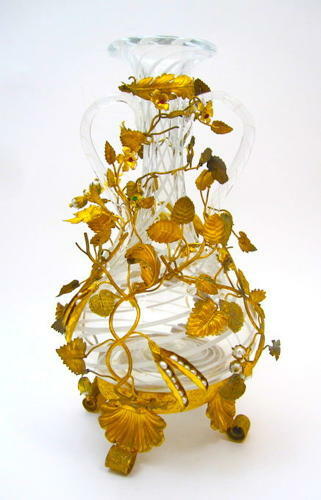 A High Quality Antique French Cut Crystal Vase with Fine Dore Bronze Mounts Depicting Flowers, Leaves and Shells. Decorated with with Stripes of White Filigree Strands. Beautiful Vase Uniquely Mounted with Jewelled 'Ruby', Turquoise, 'Emerald' and Pearl Flowers and Dore Bronze Leaves.